I have always enjoyed Groothuis in the area of apologetics and contemporary issues. This 1997 Baker book is a must for all who have to travel in computer worlds. As many such writers, Groothuis rehearses the decline in rational thinking from reading and digesting words in books to listening without seeing words on radio to seeing without reading or digesting words on television. Now we face a new era of virtual reality. 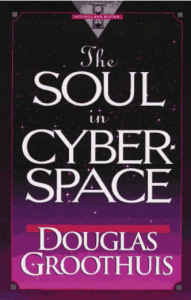 “The character of the computer screen, the strange powers of word processing, and the almost ubiquitous Internet tend to reinforce certain postmodernist themes that may undermine Christian sensibilities and a biblical worldview” (p. 65). Besides the growing problems of “hypertexting” (cutting and pasting information with little regard or knowledge of its context) and “deconstructing” (reading into the text the biases of the author), the internet carries every fleshly evil that fallen man can imagine and dream up. These, of course, are present dangers to children as well as incautious adults. Groothuis includes a chapter on “Techno-Shamanism,” (the new-age, occult and drug traffic) and an interesting look at “Virtual Communities,” the search for fellowship and meaning in an unreal world of cyber-space. Groothuis is not anti-computer use, often reminding the reader how he is writing this book on a word processor and downloading information from various web sites. He is concerned that our generation is losing touch with reality and the ability to handle real-life situations, not to mention the loss of reading and writing skills. As a seminary professor, he is not a proponent of “distant learning” but sees the day of online campuses coming quickly.